Springboks vs Scotland in South Africa this year. The Boks launch a counter attack from their own 22, the ball gets to De Villiers as he gets totally blindsided by the big Scottish winger Sean Lamont. Lamont bounces off him, then De Villiers tosses the ball to a mate and falls over in pain. Huge collision. De Villiers suffered a pretty bad rib injury from this. Lamont was fine. 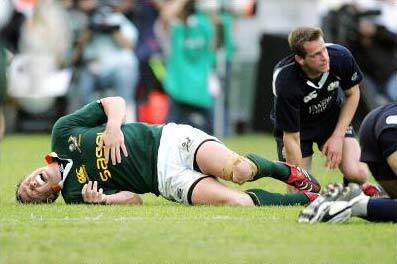 Johan Muller of the Sharks makes a great hit on the Blues replacement center in the 2005 Super12 competition. 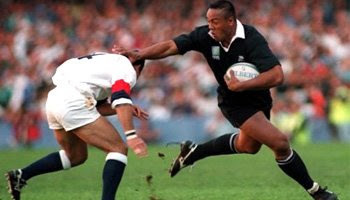 Jonah Lomu changed the game as we know it forever. 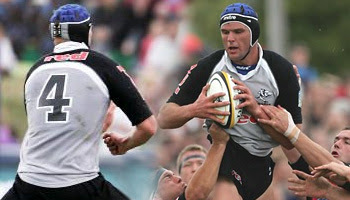 He is the most recognisable player in world rugby and the first to become truly professional. Throughout his career he battled an illness that in the end, put him out of the game prematurely. At his best he was unstoppable. Check out this great video highlights package from his career. 5 minutes long, so may take longer to load than most, but well worth it. 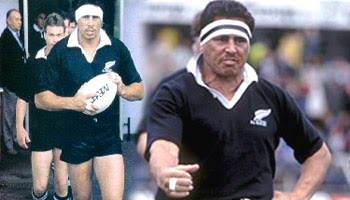 Buck Shelford was renound for being an All Black hardman. In 1987 when the All Blacks played Wales at Ballymore in the World Cup Semi-Final, the result was 49-6 but was remembered more for Shelford flooring Welsh lock Huw Richards late in the match. When Shelford spied Richards and Gary Whetton having a skirmish – the latter alleged the Welshman grabbed his wedding tackle in a maul – he decided to put an end to their frolicking and felled Richards with a well placed blow to the head. Though Shelford was also belted by a Welsh player, he remained on his feet and on the field. Richards was not so lucky. After a brief visit to la la land, he woke up to discover referee Kerry Fitzgerald had sent him off for provoking the incident. Remarkably, Shelford escaped censure by the officials and played a major role in the All Blacks winning the final the following weekend. Enland got beaten by a feisty Argentina side on saturday at Twickenham. It's the first time the south americans have beaten the English at that venue, and it's leapfrogged them up to 6th in the world rankings. England now sit at seventh in the world. Not too good for the world champions less than a year away from when they need to defend their trophy. They did score two brilliant individual tries though, so here those are. The All Blacks demolished France on the weekend by 40 points. Everyone was expecting this to be a clash of the titans, but the AB's managed to make the French look average, even after selecting their 'B' team. In the wet, the dominant All Blacks made it look like an easy game, and never gave France a sniff. We're all wondering now... will the AB's choke again at next years World Cup, or will they finally capture the Webb Ellis trophy that has been eluding them ever since 1987? Victor Matfield takes out superstar Dan Carter in this years Tri Nations game. It's a very high hit, that goes totally unnoticed by the referee. Amazingly, Carter just gets up and acts as if nothing happened. 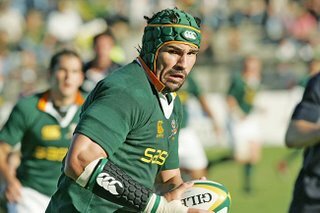 Maybe Matfield didn't have the steel plate under his arm guard this time..
On Sunday The All Blacks and England met at Twickenham once again. The New Zealanders were by far the favourites, based on recent performaces by them, and the fact that England is going through a tough time. In all fairness though, England weren't too bad and put up a good fight at times. But in the end the All Blacks won by 20 points, which was to be predicted. Final score - 41-20 to the All Blacks. Highlights below, England tries first, then All Blacks. On Saturday Wales played the touring Wallabies in Cardiff. The Australians experimented with their backline, and the gamble didn't really pay off, although they did at times look extremely dangerous and in my opinion, should have won the game. The Welsh fought hard though and the game ended in a 29-29 stalemate. A good game for the neutral, but I think the Aussies will go away more dissapointed than the Welsh. 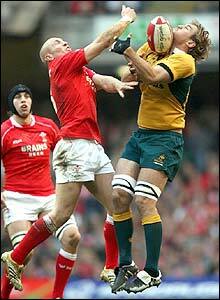 Gavin Henson gets picked up and planted on his backside by Ulsters Rory Best. Funny how the guy who edited this repeats the tackle over and over again. Go check out Henson actually doing something similar to the young Matthew Tait here.